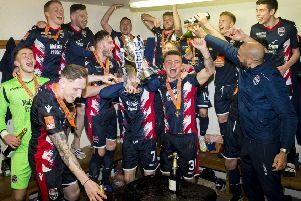 Ross County got there in the end to win the Challenge Cup for the third time in their history but only after a truly Jekyll and Hyde performance against the obstinate Welsh Premier League leaders Connah’s Quay Nomads at the Caledonian Stadium in Inverness. The Dingwall side could have been dead and buried after they put in a wretchedly insipid first half performance, but were transformed after the break. A double from substitute Josh Mullin and late third from Jamie Lindsay ultimately turned it around as their tiring opponents ran out of gas. After all the sound and fury about this competition being opened to clubs outwith Scotland there’s a touch of irony that County’s triumph sees the identity of trophy holders move a mere 15 miles up the road from Inverness and very much remain in the Highlands. Given the controversy which reached a crescendo after the debacle of East Fife’s abortive trip to Dublin to play a previously postponed quarter-final against Bohemians there’s probably some quiet relief at SPFL headquarters at the outcome. While naturally delighted at his side’s success, County co-manager Stuart Kettlewell admitted it had been a bit of a rollercoaster ride. “The first half was really difficult for us, they executed their game plan well,” he admitted. 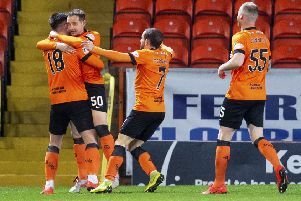 Nomads’ Inverness-born manager Andy Morrison had an extra couple of notches of motivation to see his side prevail over the men from Dingwall and they presented a different sort of challenge to what is the norm in the SPFL Championship. Big and muscular would hardly do justice to the physique of the majority of his starting XI and they knew how to play to their strengths. County seemed at a loss at how to repel their opponents’ airborne assaults and struggled time after time to hack the ball clear. Uncertainty bred confusion and they repeatedly gifted some clear-cut openings to their opponents. When presented with one of these Michael Bakare lashed the ball home in emphatic fashion after 21 minutes to give the Welsh side a deserved breakthrough following a period of sustained pressure. It could have turned into a Kazakhstan-style capitulation for County as within minutes they should have been two down when the Nomads veteran captain George Horan blasted a shot over from eight yards out with the goal at his mercy. The Highlanders’ teenage goalkeeper Ross Munro also went from zero to hero in the space of a few seconds having sent a clearance straight to Andy Owens in front of goal but recovering to make a fine one-handed save. If County were unconvincing at the back, they were next to hopeless up front in the opening 45 minutes, ponderous and lacking any threat. They had to get better after the break in every possible sense and sure enough they re-emerged like they had had the rollicking of their lives from Kettlewell and Steven Ferguson. It was the Dingwall side’s turn to lay a siege and with their part-time opponents palpably tiring it always looked a question of when not if they would get themselves back in the game. Having hit the post earlier Ross Stewart tested Connah’s goalkeeper John Danby again with a low drive, before the newly introduced Mullin surged forward and drove in an angled equaliser. With the Nomads deflated County didn’t hang about in administering a decisive blow and it was Mullin who struck again just four minutes later after picking the ball up on the edge of the box and beating Danby with ease. There were a few flashbacks to the nightmare of the first half as the Welsh side gave it one last go with more of those devilish set pieces but this time County held firm. With a spring in their steps they were able to hit on the counter and they sealed a true comeback victory with Jamie Lindsay’s late curling finish.